The freshly announced white LG Nexus 4 has officially made its way to the United States. The eye-grabbing handset can be purchased at the moment both from the Google Play store and online at T-Mobile. In the Google Play store, the white Nexus 4 is priced at the usual $299 for the 8GB version, and $349 for a 16GB device. 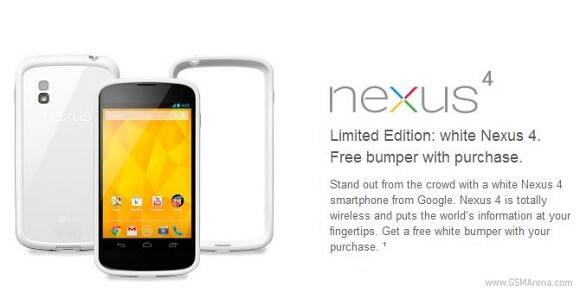 Google is also giving away a free white bumper with every purchase. T-Mobile on the other hand, charges a down payment of $19.99 for the device, followed by 24 monthly payments of $17. In case you want to buy the smartphone outright, prepare to pay $427.99. Interested? Before you press the "ADD TO CART" button, be sure to check out our hands-on of the white Nexus 4. Is this Cell Worth Buying ?? ?